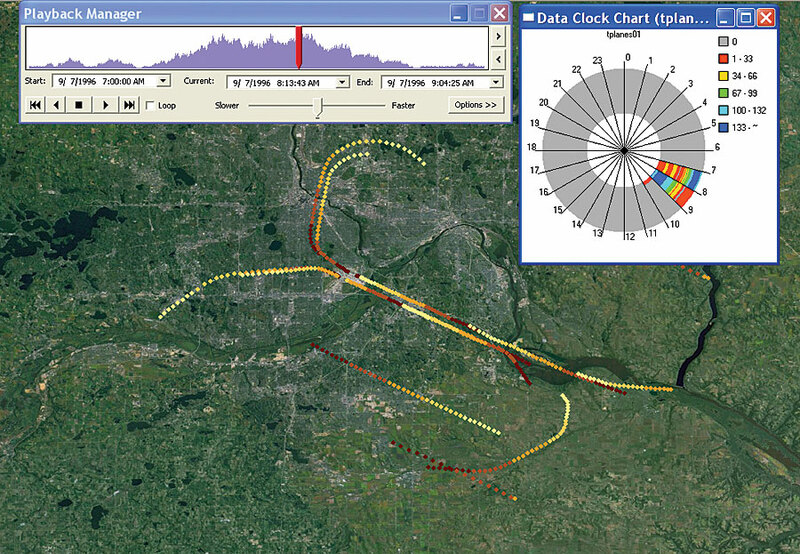 This Tracking Server example shows flights in and out of Minneapolis, Minnesota. The graphc at the top shows the level of flight activity over a four-hour period. Tracking Server 1.1, an Esri solution for collecting and sending near real-time data from many data sources and formats to Web and desktop clients, can be used to track the movement of aircraft, ships, delivery vehicles, and any other asset in motion. Use Tracking Server to integrate real-time data about these moving assets with GIS technology to make better decisions and share information quickly, easily, and efficiently. Tracking Server offers an extensible architecture that allows it to receive data from various sources and transmit that data to clients. It also logs data to a database as it is received or distributes it directly to Web and desktop clients, including ArcGIS Tracking Analyst. As a result, end users have access to timely situational awareness. The new version of Tracking Server offers improvements to handling the history of tracked objects, enhancements to the Tracking Viewer Applet (including a Javadoc API), and support for BEA WebLogic and IBM WebSphere configurations. In addition to tracking mobile assets with Tracking Server, users can also track natural resources (e.g., variable stream flow), provide situational awareness for common operational pictures in military applications, track network flows for electricity and gas, view traffic flows, view real-time data from any computer with access to the appropriate network (either intranet or Internet), and perform analysis on the data. Tracking Server is an enterprise-level technology that is integrated with Esri's other server and service products. For more information on Tracking Server, visit www.esri.com/trackingserver. Outside the United States, contact your local Esri distributor; see www.esri.com/distributors for a current distributor list.